Make Indian food at home in the slow cooker with this simple recipe for slow cooker chicken tikka masala. There was a period of time where I was convinced that I didn’t like Indian food. I know, it’s kind of insane, especially considering that it’s become one of my favourite types of cuisine. Indian is definitely our go-to when ordering takeout and there are so many amazing Indian restaurants in Toronto. We’re pretty lucky because you can find really good restaurants for practically any type of food in this city. There’s a great little Indian restaurant in our neighbourhood called The Copper Chimney which is definitely my favourite Indian spot in the city. We’ll order tons of dishes so that everyone gets to have a bit of everything. Our order changes up depending on what we want to try, but there are some standard dishes we always order; butter chicken, tikka masala and my personal favourite chana masala. I’m still working on creating the perfect chana masala recipe (it’s a vegetarian curry made with chickpeas) but I’ll perfect it eventually. Since we love to order Indian food so much I figured I would try and make a homemade version to rival takeout. My experimentation with Indian food started with my recipe for slow cooker butter chicken – which is one of the most popular recipes on the site. I took the same principles and techniques I used in that recipe to create this recipe for slow cooker chicken tikka masala. The base is similar to that of butter chicken, but instead of coconut milk this uses a touch of cream stirred in at the end and is more of a tomato-based dish. Now I’m not going to pretend that this is the most authentic version of chicken tikka masala on the planet, but it’s a recipe that is simple and uses familiar ingredients for delicious results. Anyways, these simple and flavourful recipes are why you’re here, right? I feel like I’ve been posting a ton of slow cooker recipes recently, but it’s that time of year, so can you blame me? I feel like every year slow cooker recipes get more and more popular which is fine by me since they are some of my favourite recipes to create. I’ve been using my slow cooker for so many years that I recently shared one of my favourite tips for cooking with a slow cooker on my YouTube channel – this is a great way to deal with some of that excess liquid leftover that you might have when cooking in the slow cooker. In a large bowl, whisk 1 tsp garam masala, 1 tsp paprika, 1/2 tsp coriander, 1/2 tsp cumin, 1/2 tsp salt and 1/4 tsp turmeric. Add chicken and toss to coat. Heat a large frying pan over medium-high heat. Add 1 tbsp oil then chicken and cook until browned, about 3 minutes. Transfer chicken to slow cooker insert. Add remaining 1 tbsp of oil then onion. Cook until softened, about 2-3 minutes. Add garlic, ginger and remaining spices and salt. Cook until fragrant, another minute. Add passata and sugar, scraping brown bits from the bottom of the pan. Pour tomato mixture over chicken and cook on low for 6 hours. 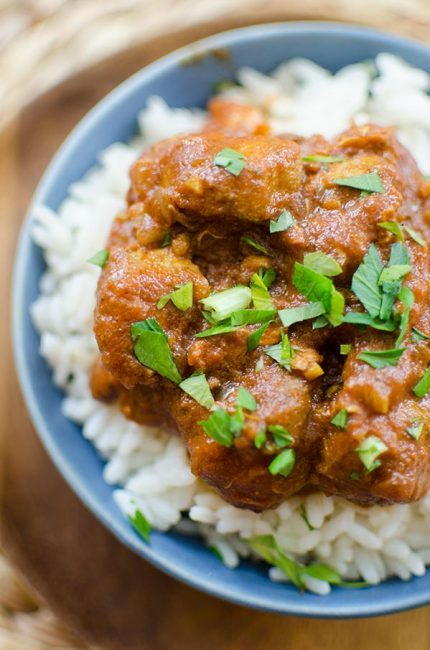 Let me know if you give this slow cooker chicken tikka masala a try in the comments below. Thank you Shantanu! I'm glad you enjoyed it. Superbly made!!! I must try it tonight... every ingredient & their quantity are reasonable & it can be easily made... So delicious... Thanks a lot dear!!! Ohhhhh yes! 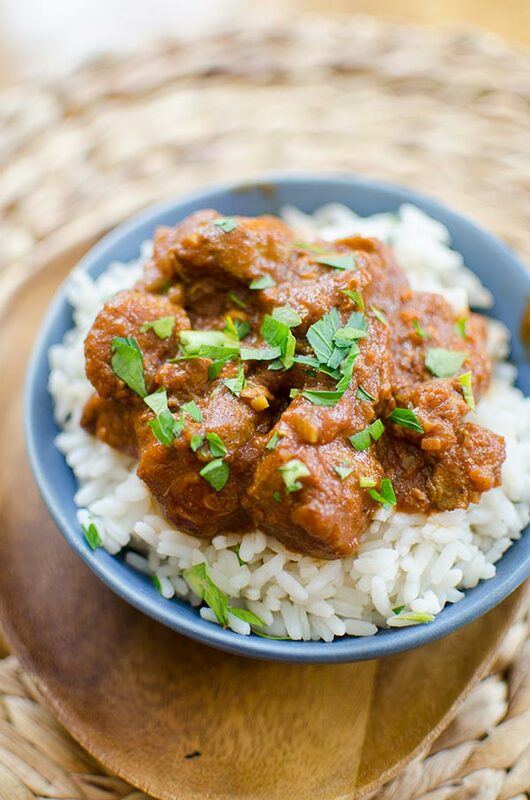 Indian food in the slow cooker is absolute genius. Must try! Great recipe, Louisa! It was perfect for this Arctic freeze winter we’re having here in the Northeast. I added some chicken legs and they turned out delicious. This recipe is a keeper. Up next: your Butter Chicken recipe. Thank you Suzanne! I'm so happy that you loved this recipe, it's so perfect for cold days. Enjoy the butter chicken!